If you’ve used an Android Honeycomb-equipped tablet for any length of time, you’ve probably run into a serious issue: there just aren’t that many good applications that have been optimized for the tablet form factor (or at least, they’re impossible to find). Sure, there are some phone apps with minor tweaks that scale up nicely, but in terms of apps that feel like they were built with Honeycomb in mind, the pickings are slim. 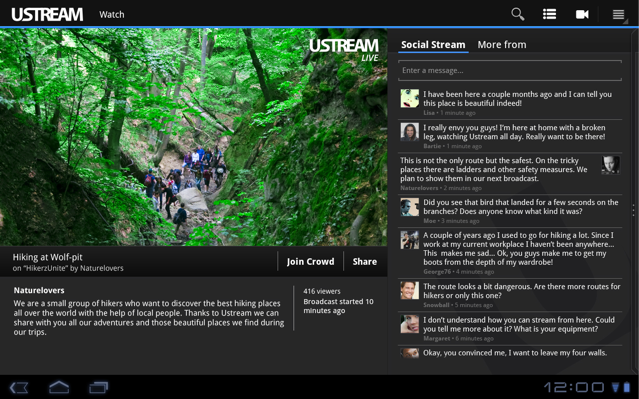 Well today, Honeycomb is getting a very nice addition its app catalog, complements of Ustream. The popular video service, which lets users stream their content live to the web, for free, has just launched a version of its Android app. It’s available right here. The app is pretty much what you’d expect, and it’s done well. You can watch both live and archived content, and, in a feature that may lead to a major influx of mobile streams, you can upload live from your tablet as well (cue hundreds of people uploading couch-side reflections on the TV shows they’ve just watched). The service’s social features are also baked in — you can view a real-time stream of comments and run polls directly from the app. These features are all available on supported phones, too. All in all it’s a solid app (and it makes me wish more apps on Honeycomb felt like this). Oh, and don’t worry iPad fans — a new tablet app will be coming your way in the near future as well.